If you’ve been told you or your child needs orthodontic treatment to correct misalignment, you may be considering traditional braces vs. Invisalign®. There are plenty of factors to consider when weighing your options, such as treatment timeline and cost. At Harlem Center for Aesthetic Dentistry in New York, NY, we can help you determine which option is right for your unique needs and budget. Unfortunately, not everyone has a choice between traditional metal braces and Invisalign®. For patients with more severe and complex misalignment issues, we may recommend metal braces because these are more effective. Invisalign® is typically a better choice for patients who only need mild to moderate orthodontic treatment. Orthodontic treatment with traditional braces can take up to two years or more to complete. That’s a long time for some people to walk around with braces, and it can lead to self-consciousness and other problems. Invisalign® treatment timelines may take as little as nine to 12 months to complete. However, Invisalign® timelines are entirely dependent on the patient’s willingness and commitment to wearing the aligners for 20 to 22 hours every day. Traditional braces are usually less expensive than Invisalign®. However, most dental insurance plans cover at least a portion of orthodontic treatment, regardless of which option you choose. Insurance coverage can make Invisalign® a more affordable treatment option for many patients. There’s no question that Invisalign® is more comfortable than traditional braces. There are no rubber bands or metal brackets or wires that could poke you. They are also removable, so brushing and flossing your teeth is simple. 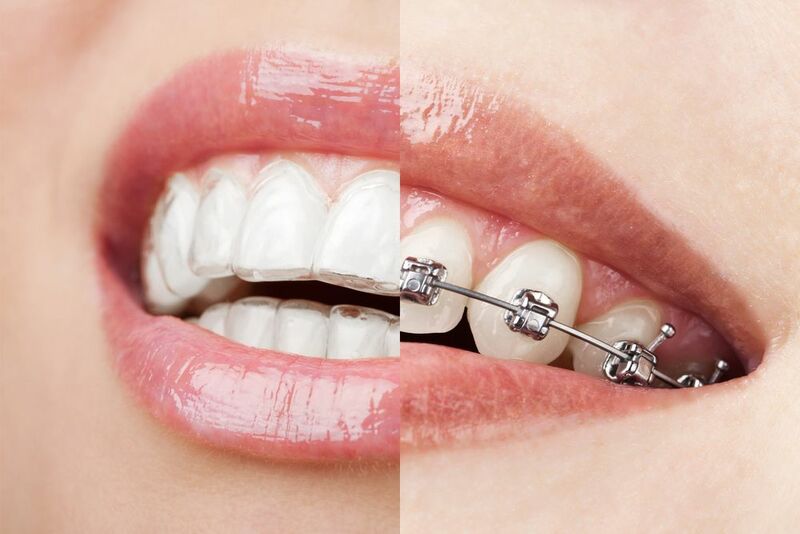 Keeping your teeth clean with metal braces is a lot more complicated. As a result, many patients end up neglecting their oral health more with traditional braces. If you choose traditional braces, you can expect to get adjustments every four weeks. These are often uncomfortable and that discomfort may last a few days. With Invisalign®, patients generally come to the office every six weeks or so. At this time, we monitor their progress and then give them their new aligners. No painful adjustments whatsoever. Metal braces come with a long list of foods you can’t eat: popcorn, corn on the cob, caramel, chewing gum, etc. If some of your favorite foods fall into that category, you’re out of luck until the braces come off. The Invisalign® aligners are removable, so you can eat whatever foods you want, whenever you want. Traditional braces are metal. They are about as obvious as they come. The metal brackets also use rubber bands, which come in a variety of colors. This can draw more attention to your smile if you choose bold colors. Invisalign® uses clear aligners that are virtually invisible to everyone but you. If you need braces, contact our office to schedule an orthodontic consultation. We can help you decide whether traditional braces or Invisalign® is right for you.